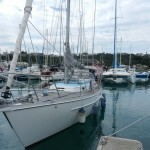 In mid-April 2012 we arrived back in Port du Sud marina, Noumea, and boarded Rireana. Thierry had kept very good care of her and we soon had her back in living order. 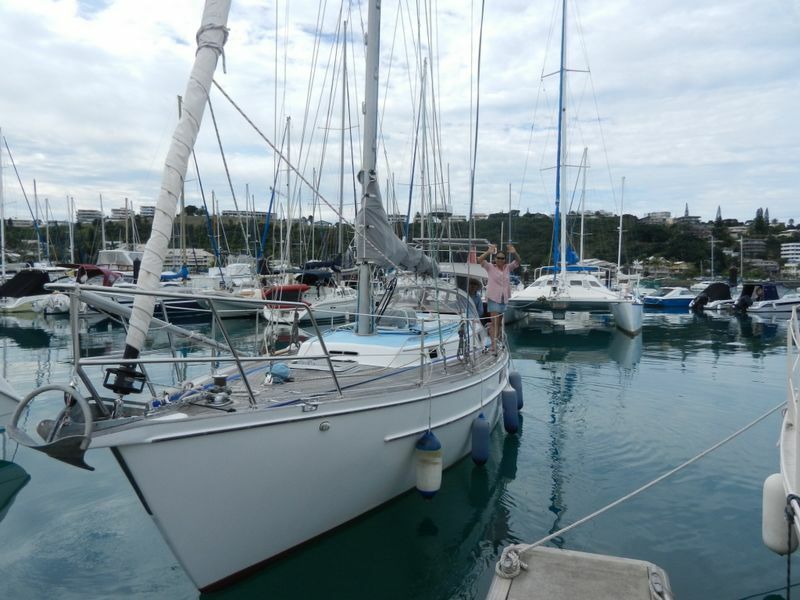 On 1 May, the end of the cyclone season, we hauled Rireana out of the water at Nouville Plaisance, also in Noumea. This hardstand area for boats is well run and maintained. It has a travel lift and plenty of chandlery services nearby. By Noumea standards it is also relatively cheap and compared well in price with hardstands in New Zealand and Australia. The only drawbacks are that you have to provide your own water-blasting equipment and ladders. 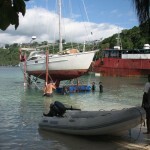 We re-launched Rireana in the middle of May and prepared for the voyage to Vanuatu. During our time in Noumea we were again royally entertained by our New Caledonian friends, all of whom were very willing to assist wherever they could. Jose lent us his water-blaster and ladder and even went to the extent of helping us with the anti-fouling, and Raymonde was, as always, the most generous hostess and organiser. Stefan and Carolyne from Fruity Fruits took us sight-seeing and gave much useful local boating advice, as did Patrick of Proton. Everyone was very hospitable. 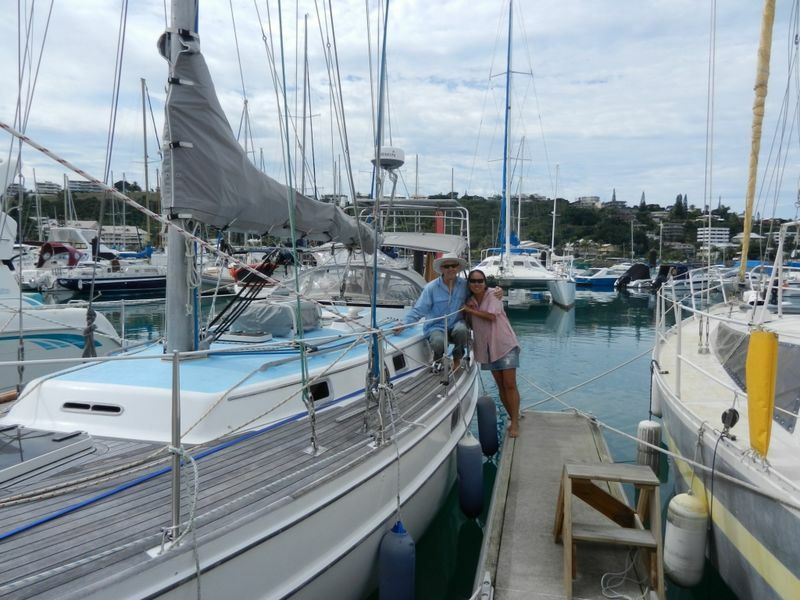 On 14 May we cleared out of Noumea and sailed to Port Boise where we anchored for the night. At dawn the next day we made a relatively easy trip through the Havannah Passage and set course for the island of Mare in the Loyalty Islands. We had a rough plan to anchor off the main port of Tadine overnight. However, on arriving at Tadine we found an uncomfortable roll in the anchorage and the south-easterly trade wind was bending around the southern point and putting us onto a lee shore. We therefore kept sailing north, picking our way between the small islands between Mare and the next large island of Lifou. The night was pitch black and the only navigation aid in the area is a light on the eastern tip of Lifou. This was obscured most of the time and so we relied solely on radar and our chart plotter. It is amazing how technology has taken a lot of the stress out of small vessel navigation. 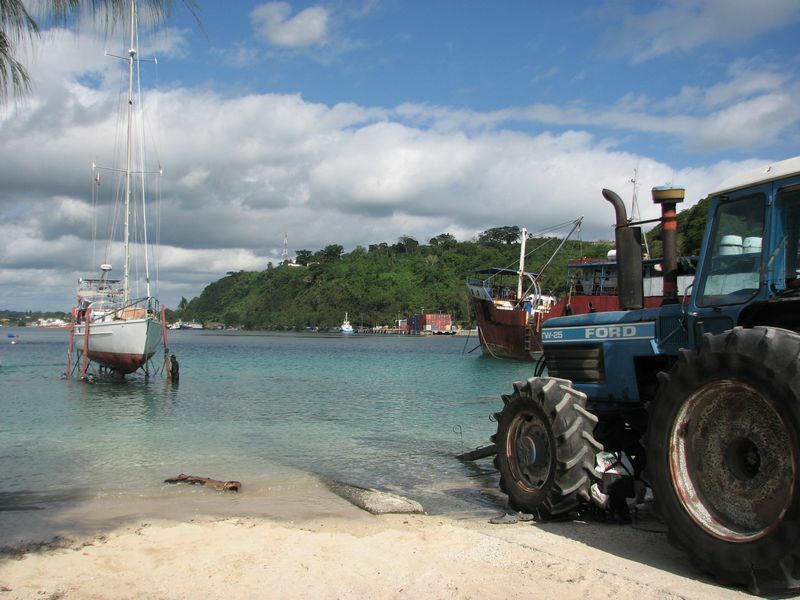 By midnight we had reached the northern tip of Mare and with a fair wind from the south-east, decided to head for the island of Tanna, one of the southern islands of Vanuatu where yachts can complete customs and immigration clearances. By the middle of the next night, the wind had risen and we rounded the southern coast of Tanna under a double-reefed main and heavily reefed headsail. We steered further south, and covered more miles, than necessary to make certain our landfall at Port Resolution was in daylight – well that is what we say anyway. We ran quickly up the east coast of Tanna and surfing on a couple of large swells, entered the harbour at Port Resolution at about 1000 hours. There were half a dozen other boats in Port Resolution during our stay there. We took a ride on the back of a ute over the hills to Lenekal to clear in, a couple of days after anchoring. No-one seemed to mind this delay. The weather was foul and the ute became bogged down on more than one occasion. It had to be dug out of ruts in the track and hauled and pushed up very slippery parts. By the time we got to Lenekal we were all (about a dozen of us) wet and cold. We cleared customs but the immigration officer was ill and in hospital. We therefore didn’t manage to clear immigration until arriving in Port Vila about a week later. Again, no-one was too bothered. We stayed in Port Resolution for 4 days and were well looked after by Stanley who will organise/obtain/make/source anything a yacht could need (within the limitations of a remote tropical island of course). We weighed anchor and sailed north out of Port Resolution on a clear sunny day. As we reached the strait between Tanna and Erromango (the next island to the north) the wind increased and we ended up having to heave to and put 3 reefs in the main. The sea was boisterous, as is often the case around Vanuatu, but once we gained the lee of Erromango everything calmed down and we anchored in Dillon’s Bay in the mid-afternoon. We spent only 24 hours there but can highly recommend the anchorage (in trade wind conditions) and the village. The next afternoon we set sail for Port Vila. Again, once clear of the lee of Erromango, and it is a long lee, we encountered strong winds and boisterous seas. We had 2 reefs in the main and a heavily reefed headsail and were blasting along on a broad reach at 7 plus knots. For comfort’s sake we should really have had 3 reefs in the main, but it was dark and wet and slippery on deck so we chose to carry on at speed. We raced through the night and just south of Port Vila caught up with a 50 foot ketch that had left Dillon’s Bay before us. We hadn’t managed to sleep but we were clear winners of the race which the ketch knew nothing about. 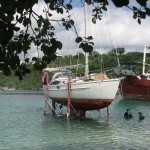 We picked up a mooring in Port Vila as day broke. We spent time in the Maskelyne Islands and Port Sandwich on mainland Malekula during our work for the Trust. 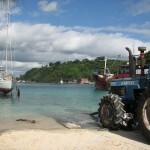 We called in at the island of Epi, and Havannah Harbour on Efate, on our trips between Vila and Malekula. Most of the time we had wonderful sailing conditions with the wind just forward or abaft the beam and blowing 12 to 20 knots. Once on the way from Epi to Port Sandwich we had a scorching blast with 35 knots from dead astern. 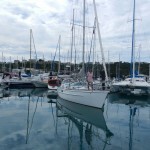 We try to pick our weather as much as possible for these trips as bashing to windward in the confused seas of Vanuatu against the trade wind is as much fun as having a bath with an alligator. Instead of taking Rireana outside the cyclone zone to Australia or New Zealand, we again decided to keep her in the tropics for the 2012/2013 cyclone season. And in order to do as much Trust work as possible, we decided to keep her in Vanuatu. 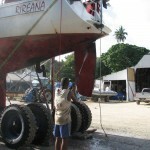 So at the end of October we hauled Rireana out of the water at the Port Vila boatyard. This was an entertaining procedure involving many divers chocking the boat level on its cradle before she was hauled out by a winch on the back of a tractor. 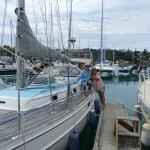 We then spent three weeks preparing for any possible cyclones, including removing everything from the deck, including all halyards and the solar panel. We lashed Rireana to her cradle and also to concrete blocks in the ground using ratchet type cargo straps. (One half of a foldable anchor ball makes a perfect rat guard for a cargo strap.) We then crossed our fingers and flew back to New Zealand for 3 months of work and fundraising.